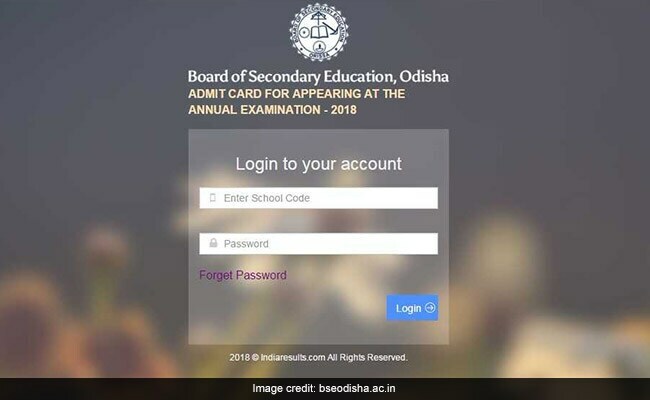 NEW DELHI: Board of Secondary Education (BSE) Odisha has released admit card for annual HSC exam 2018. The admit card is available at the official website of the Board at bseodisha.ac.in. HSC admit cards can be downloaded by using school code and password. Annual HSC exam for both regular and ex-regular candidates will begin on 23 February. The exam will be held on the same shift (9.00 am to 11.30 am) and there will be one question paper for both. However candidates will be given 15 minutes extra for Mathematics exam. Practical exams for vocational courses will be held in the respective schools from 12-17 February 2018. Candidates securing minimum of 30% of marks in each subject or group of subjects and securing at least 33% but less than 45% of marks in the aggregate, shall be declared to have passed in the Third Division, Securing at least 45% but less than 60% of marks in the aggregate shall be declared to have passed in the Second Division, and Securing at least 60% of marks shall be declared to have passed in the First Division. PREVIOUS POST Previous post: 10 best paneer recipes that are so tempting you would want to try them all!